A blurry object moved through the water swiftly. It swirved this way and that, but then suddenly disappeared. A large creature burst from the water and landed on the shore. A dragon. A fish was wriggling in his mouth, and he dropped it on the shore to dry his wings a bit. Nodin looked at the griffin quietly, setting his wings down from the extended position he had them in to dry. He bent over and bit off the fish's head, its blood mixing with the dry sand. "There," he growled in his low voice. He shook off one wing, then the other before he began eating the fish. He ripped off chunk after chunk, swallowing them whole. i nodded silently, studying the dragon. it wasnt a true dragon, i could tell that from how he ate. Nodin finished eating and licked his chops. "Tastes better than grass..." he murmured quietly, then looked over at Ensis. He cocked his head slightly as he saw him staring. "What do you want?" i look at the other gryphon and flare my wings in the sign of caution and hostility. i narrowed my eyes "sea gryphon" i hissed. they were the proud and arrogant breed of gryphons. i studied her wings, feeling a tinge of envy. they were large and long and beautiful, while mine just....... they were just...... they just were. i lower my wings and open my eyes to the normal wideness. i stand, my chest feathers puffing out, i was a proud animal. i might have been from lowly lineage and a very humble breed, but i still had my stubborn pride. i study her narrowly "greetings"
Shira: i mean no harm to you sir. i nod "i know that. but my breed has seen many of lost meals and beatings by the way of the talon of your breed" i bow my head cautiously and say " i am Ensis, a forest gryphon of the house of Karn"
Nodin glanced from one creature to the other. He coughed a little and then smiled. "I'm not a real dragon," he said quietly, then he transformed to his stallion form. He pawed the earth viciously. "I have a few different forms." i nodded quietly and say "hello, nodin. yes i know who you are"
Nodin's mane bristled a little. He didn't like not knowing those who knew him. "And where'd you learn that from?" he growled lightly, tilting his head. i shrugged "instinct i guess"
Nodin's eyes narrowed. He snorted and lifted his tail, pawed the earth again, then settled. "So what's your name then, gryphon?" he asked. 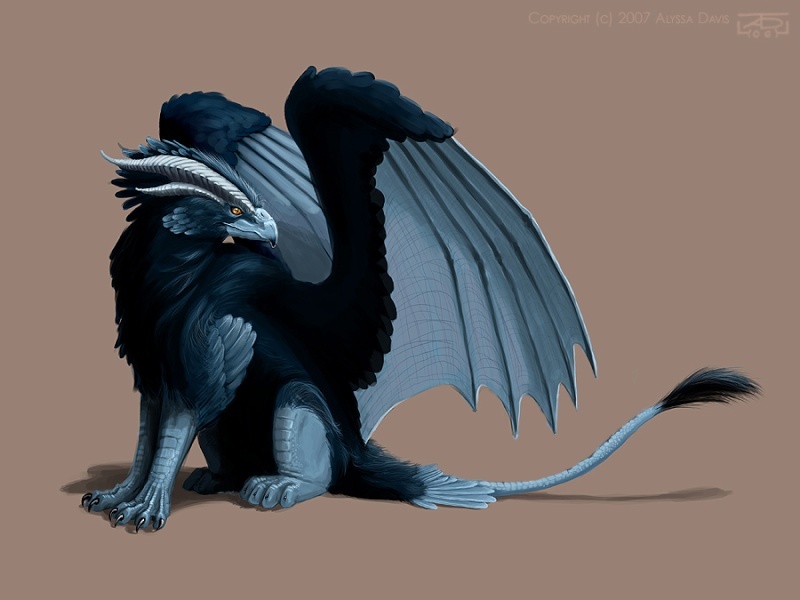 i bowed my head slightly and said proudly "i am Ensis, a forest gryphon of the house of Karn"
Nodin looked him over quietly, noticing his wings weren't completely made of feathers. "Okay then, Ensis. I'll introduce myself anyway," he said, smiling as the gryphon bowed. He bowed a little himself, though he didn't know why. "I am Nodin, a follower of the Goddess of Chaos, Eris." Nodin watched the gryphon fly away. He stood up straight and shook his mane. He glanced once at Shira before trotting down the beach and off into the forest.